Fourth of July festivities ended with fireworks. Life, liberty, and the pursuit of happiness. Oh, and maybe a cold drink. 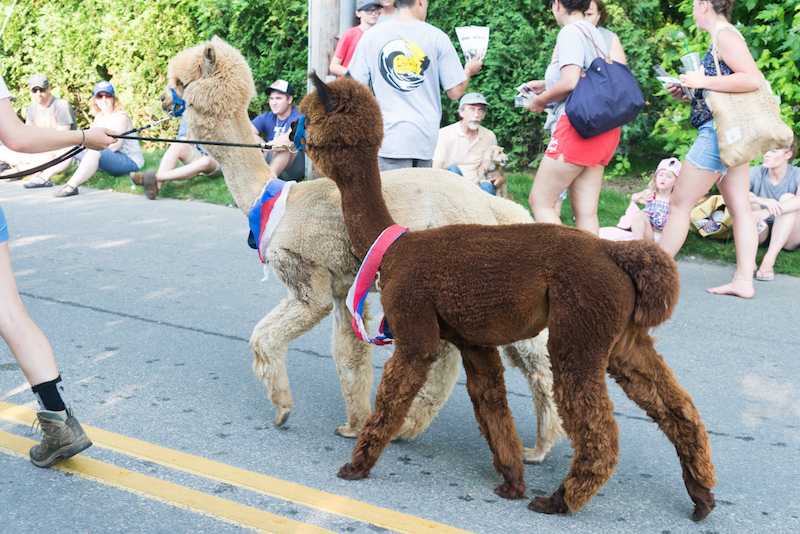 Such were the pleasures celebrated at the annual Edgartown Fourth of July parade, a tradition that has long delighted Islanders, summer residents and tourists alike. 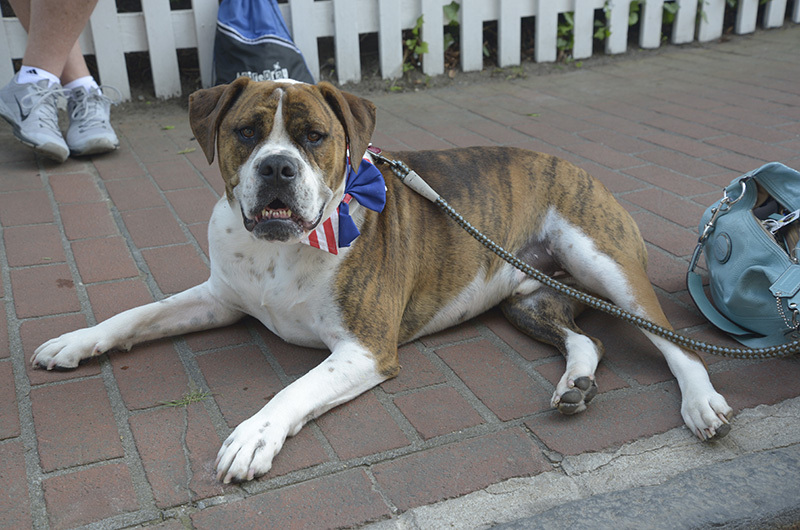 Hundreds of people crowded the streets of Edgartown to see the floats, whistle to the tunes of the marching bands, and wish America a very happy birthday. As if on cue a group of veterans passed by, some waving from a vintage Mercedes while others marched proudly through the street. The veterans led the charge with members of the Edgartown police department. 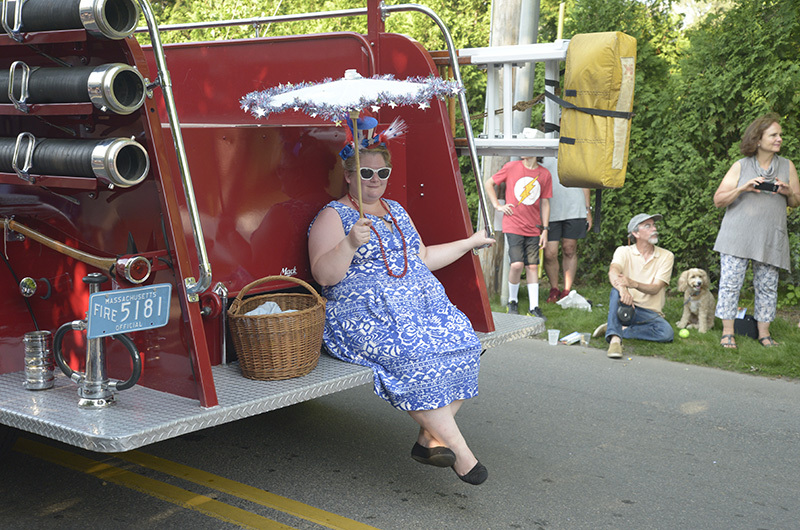 Following closely behind were Island selectmen, with sparkling antique cars carrying representatives from each town. Vicki Danberg drove the county commission’s car, a lipstick red 1986 Mercedes 560SL. She was joined by Christen Stashenko and John Alley, all three wearing bedazzled American flag hats. When asked if she would be throwing candy into the crowd, Ms. Danberg shook her head. “My husband is a pediatric dentist so he won’t let me back in the house if I do,” Ms. Danberg said with a laugh. Mr. Alley chucked from the backseat, his foot nudging a huge bag of sweets, clearly not planning on abiding by the same rules. Many parade participants tossed candy into the crowd, along with stickers, temporary tattoos and even plastic coins. “Look, money!” one child shouted as he raced to claim his gold and silver thrown by the pirates aboard Pirate Adventure Martha’s Vineyard’s float. The patch-eyed pirates also squirted spectators with water-guns, a much needed cool down during the sweltering 82-degree evening. Folding chairs were pulled up to the edge of the sidewalks, their occupants leaning forward in eager anticipation. Beach towels were also spread across the hot sidewalks, although some spectators were content to sit right down on the curb. “The only thing is it’s so hot,” said Kettlyn Ribiro referring to the exposed brick, and the humidity. She sat alongside Agata Rodriguez, a fifth grader from the Martha’s Vineyard Public Charter School. “I’ve been in the parade before with the Boys and Girls Club basketball team, but this is my first time watching it,” Agata said. And she wasn’t the only one new to the spectacle. 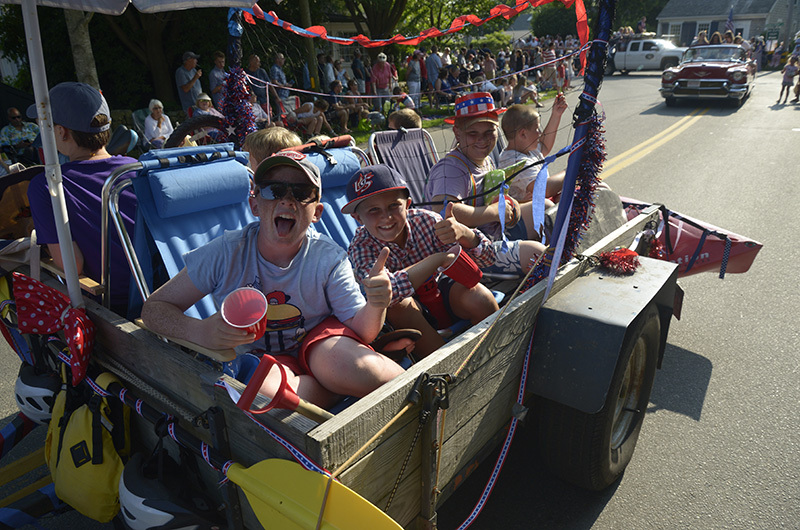 MVRHS sophomore and West Tisbury resident Rachel Salop expressed her excitement about witnessing the parade for the first time. Joined by her younger brother and cousin, the trio stood at the corner of Main street and the Edgartown-West Tisbury Road waving and cheering as each float went by. Most Island organizations involved in the parade have been participating for years. Camp Jabberwocky, whose float won the prize for best in show, is just one of many upholding the tradition. Decked out in whimsical Hollywood-inspired costumes, the Jabberwocky campers and staff alike grooved to a lively drumbeat through the parade’s route. The theme of their dance party? Jabberwocky Boulevard. Felix Neck Wildlife Sanctuary took home the award for most original float, their group advocating for one message: every day is world ocean day. The truck was covered in jellyfish, thankfully none of them possssing any real stinging power. Instead the sea creatures were made from umbrellas with blue, purple, and turquoise crepe paper tentacles. Members of The Yard also wowed the crowd from their rolling dance floor — a flatbed truck — with one dancer landing a backflip in a full split. The Edgartown fire department brought the parade to a close with the spraying of their 1855 Button Tub — an antique piece of equipment once used to put out blazes. The water shot into the air in front of the Old Whaling Church, children shrieking with joy under the cool mist. 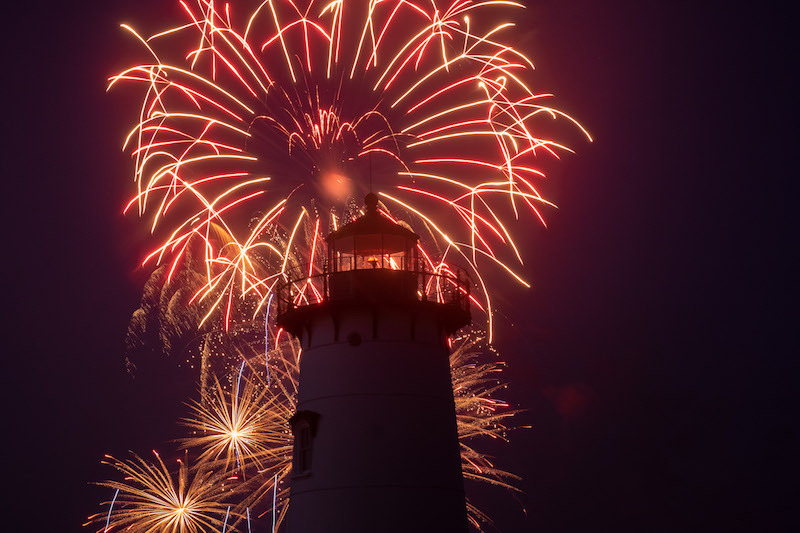 The skies were colorful and loud deep into the night above Edgartown harbor, the boom, boom, boom of fireworks announcing a nation turning another year older. More Fourth of July parade pictures.